At 1:45 p.m. on July 25, at Henoko, Nago, former prime minister Yukio Hatoyama (right) listens to residents who are opposing the construction of the new base. On July 25, former Prime Minister Yukio Hatoyama dropped in at Henoko fishing port in Nago, during his stay in Okinawa to take part in a symposium. After visiting the tent of a 17-year ongoing sit-in, he surveyed the shore of Camp Schwab, the planned relocation site for the U.S. Marine Corps Air Station Futenma, from a boat. 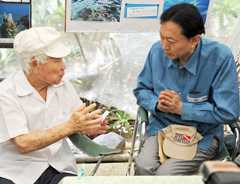 Hatoyama listened to residents explain the environmental value of the sea surrounding Henoko. He scooped up seawater in his hand and watched a sea turtle near a small island Nagashima on Oura Bay for about 50 minutes. After his visit, Hatoyama stressed, “It is a denigration of nature to build a huge structure on such a wonderful sea, one of the most important marine in Japan.” He added, “It is outdated to beat drums by hyping the China Threat Theory. This is now a time when we must review the presence of U.S. military bases.” The former prime minister criticised the government’s plan to build a new base in Henoko.